Preserve at Rock Creek is pleased to share open houses this weekend: Friday the 15th from 10am until 5pm, Saturday the 16th from 10am until 4pm, and Sunday the 17th from 10am until 4pm. Our available homes boast incredible mountain views, easy access to hiking trails, and a breathtaking natural waterfall. We invite you to come experience Preserve at Rock Creek this weekend and please check out our video below. It showcases some of the incredible views from our unique property. Earlier this week we had local Master falconer, Peter Kipp, visit us along with his red-tailed hawks, Jade, Macho, and Chance, to demonstrate the art of falconry on our majestic mountain. Red-tailed hawks are native to our area, but getting to see them up close and personal while they worked with Peter was incredible! Falconry has a long and rich history, which can be traced all the way back to 2,000BC in Mesopotamia. In medieval Europe, falconry was the sport of nobles and kings. Now, it continues as a hobby around the world, and has begun to gain popularity in the United States through demonstrations at games, fairs, and private events at communities like Preserve at Rock Creek. 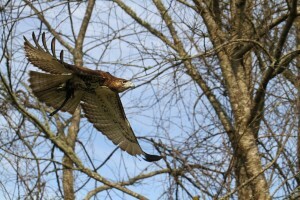 A red tailed hawk flying during a Falconry demonstration at the Preserve at Rock Creek near Cashiers, NC. All falconers in the US are required to be licensed. An Apprentice License comes first, then a General License. With enough time and training, a Master License can be earned. It is an amazing experience to watch a trained bird of prey perform exercises and hunting simulations in a natural, mountainous setting. If you’d like to set up your own personal demonstration, Peter can be reached at 828.883.4500, or contact us if you’d like to discuss hosting a private demonstration in the Preserve at Rock Creek meadow. Exciting news for photographers who hike! Headwaters Outdoor Adventures will soon be offering a series of hiking and photography trips in Panthertown Valley with Todd Ransom, a noted photographer and guidebook author. Panthertown Valley has been designated by the Forest Service as “Management Area 5,” which means it is being allowed to return to its natural state. A network of trails crosses the valley, but no further development will occur. These trails range from old roadbeds to steep, narrow, twisting mountan trails. For this reason, Headwaters Outdoor Adventures requires participants to be able to hike for 2-3 hours at a time. Particpants will not only go on a beautiful hike through the Nantahala National Forest, but will also learn the basics of exposure on digital cameras, including evaluating lighting conditions, how to use a histogram, and adjusting exposure levels for optimal mountain shots. The trip begins at the Cold Mountain Gap trailhead, and the photography instruction begins after a short hike to Schoolhouse Falls. 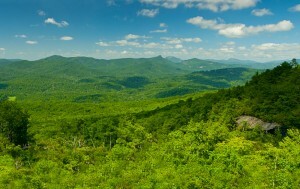 Once the basics have been covered, the hike will continue to different picturesque locations in Cold Mountain Valley to practice additional photography techniques. These trips will be offered for a limited time, so contact Headwaters Outfitters to reserve your spot. Upcoming dates are September 20; October 1, 11, 15, 25, and 29; November 1, 8, and 22. This is a great opportunity to develop photography skills in a beautiful part of Western North Carolina. When you’re finished, come by Preserve at Rock Creek – we’ll give you a tour of our mountain and let you practice your new photography skills on our spectacular views and waterfalls. Located just before the crossroads on Highway 64, Cashiers Farmers Market has been a mainstay for area residents since 1995. If you're looking for locally grown fresh fruits and vegetables, artisanal jams and jellies, native flowers and plants, or gourmet foods you will find them all here. Fresh, local produce arrives daily and is complemented with a selection of seafood and farm-raised poultry and beef. Fresh-baked breads and locally canned jams, jellies and condiments are also abundant, as are homemade pies, cookies, pecan brittle and other treats. The Farmers Market is also home to BBQ On the Side. Their pulled pork, shredded chicken, and rack of ribs are delicious and come with a selection of sauces and side dishes made from scratch. BBQ on the Side also features their daily dessert specials. It's a great place to stop in for a sandwich at lunch or pick up dinner for the whole family on your way home. They also provide catering for sports events, weddings, reunions, backyard parties and other special events. For us, the abundance of local and fresh foods at Cashier Farmers Market make it a frequent stop.